Plexidor Pet Doors: Have you tried flyball? Training for a sport can be a great way to strengthen the bond between dog and human. It's fun and it provides exercise. 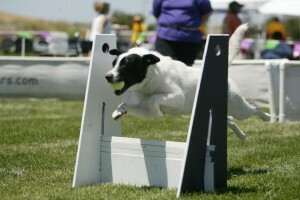 Flyball is a team sport with the added benefit of meeting other people and other dogs. Each team has four dogs, and only one dog from each team will be on the course at a time. That is, the next dog isn't allowed to start until the previous returns. The point of the game is for each dog to run a course with four jumps, reach a box where the dog has to release a tennis ball, catch the ball, and bring it back to the starting line - over the jumps. If anything goes wrong - for example a dog drops the ball, or runs to the side of a jump instead of going over - it must do the course again. All dog sizes can participate. The jumps are determined based on the shortest dog in the team, so it's an advantage to have a small dog on a team. To start training, search for a club and classes in your area. Your dog needs to have a good recall even with distractions - a flyball competition is a busy and noisy place with dogs barking, people running around, balls, and dogs running the course. This is a great way to spend quality time with your dog, while making new friends.